applications based on libmono-winforms2.0-cil do not display a icon on the launcher. One only sees the generic questionmark. Also it shows three lines which indicate the number of instances when there is only one. In the unity app place and the gnome2 menu the icon is displayed correctly. I tried to find a workaround but none of the launchers created would associate to the mono application. attached screenshot with regular icons. Not sure if this is useful information but weirdly the icon for keepass appeared after having restarted compiz while the mono application was open. If I restart Unity it reverts to the old 'unknown' icon. Although the icon appears correctly the launcher issues still remain. In the newly attached screenshot, the green icon is the custom launcher I created for keepass mono application. The green launcher can start the application but has no further functionality once keepass has started and instead the blue icon/launcher will appear for the opened mono application. This blue launcher can be kept on the unity launcher but if keepass has been closed it will not reopen the application when clicked. Am also seeing this in 11.10 with official keepass2 package. Any chance this could get bumped up in importance? I'm not as worried about the missing icon. I can live without that. What worries me as that when you right click the icon and Quit, it closes one of the Unity processes - panel, dash, DNDCollectionWindow, launcher. I would like to confirm Simon Gill's issue, 11.10 & official package. I have a grey questionmark icon and the name is "panel". This also happens with application using libogre.. I installed precise 12.04 but the question mark remained. 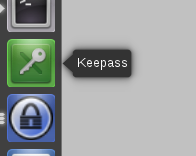 I was logged into unity2d and didn't notice, when back in unity the questionmark reappeard, alhtouh it only has one of those arrow things instead of three and clicking on it actually brings up keepass more reliably than before. I can confirm this bug in Precise as well. My custom winforms mono app shows up a question mark on the launcher. What is an even bigger issue is that as Simon Gill pointed out, trying to quit the application from the Unity launcher actually closes Unity itself. This is a pretty big issue in my opinion. Yeah I have the same issue with Unity closing/crashing..
Alt-Tab and holding on the KeePass2 application shows 3 windows (one corresponding to the app, the second named launcher and the third one named panel). Oneiric install of keepass2 here crashes/freezes Unity completely. 2) observe grey question mark icon in launcher with 3 arrows. 4) Unity is frozen, mouse pointer still moves, but no keyboard/mouse interaction is possible. I switched to a virtual terminal and restarted Unity, but noticed display corruption in the tty. Many characters are replaced with seemingly random ascii non-alphabetic characters. This is a show-stopper bug and should have a much higher Importance set. Equal to #22 and previous. Keepass2 crashing and affecting unity. Earlier mentioned workaround does not work on my machine (Ubuntu 12.04 on Unity). a) Look at the screens in the attachments - make sure that keepass2 is limited to a single instance and set options to minimize instead of close and to minimize to tray instead of task bar. b) I have put keepass2 to my startup applications (using traditional Gnome menu which I have added back) - wherever that is done on the commandline feel free to use that. No the launcher disappears after logging in to keepass2 and closing the window. Which is perfectly fine - it stays now in background and the hotkey is now working. At least you cannot accidently quit unity now during normal work and the annoying questionmark icon is gone. Before you ask: No, the icon is not displayed in the notification bar on the upper right. But using Dash to start it, brings back the existing instance. I'm on a fresh Ubuntu 12.04 (64 bit) install. KeePass2 works fine most of the time, I can use the launcher icon to close and focus the keepass window, and there is only 1 arrow to its left. The icon is displayed correctly as well (no question mark, it's the blue keepass icon). The only problem is with keeping the icon on the launcher when keepass is closed (not sure what the name of that feature is in English). Clicking the icon causes it to blink a few seconds, but the window is not re-opened (while ps aux tells me the process is still alive). At the same time, using the dash to open the window works fine but creates a second, non-permanent launcher icon. The permanent launcher icon does not work after shutting down keepass as well (with no keepass process running). Launching via dash still works in that case. At this opportunity update to my experience: Since one of the last bulk of updates I can see the correct icon. However, it does not activate the window immediately - I have to click a second time onto the launcher (when keepass was already running). To work around this do my suggestions from #27 of this bug. This bug looks like it is caused by mono winforms not setting the WM_CLASS X11 property. mono winforms (or the application themselves) should call the X11 function XSetClassHint. I've just hacked my winforms application to do this, and it fixes the issue for me. Could you please add an example? Still seeing the symptoms from #28 for KeePass 2.18 and Ubuntu 12.04 (64-bit, fresh install on a new machine). The Unity launcher is basically of no use with KeePass2; you have to use the HUD to launch it. My custom winforms application has this same problem. unbntu 12.04 importance of this issue should not be low. > importance of this issue should not be low. * Added Mono workaround to set the WM_CLASS property. If keepass2 Upstream implemented a workaround 2 months ago, why is the bug is still marked invalid for keepass2? Can the keepass2 maintainer comment? Also, it sounds like maybe the real defect is in Mono itself. Does anyone know which mono package would be appropriate to mark as affected? its invalid for keepass because its not keepass's buisness to fix it. Another problem of KeePass is that is not setting the _NET_WM_PID atom, so for BAMF it's hard to find many of the informations it needs to do a correct matching. Bamf side is currently doing the most it can, so marking this as fixed. and notify about its changes. New tests added. Fix Released in Bamf BAMF 0.5.0.